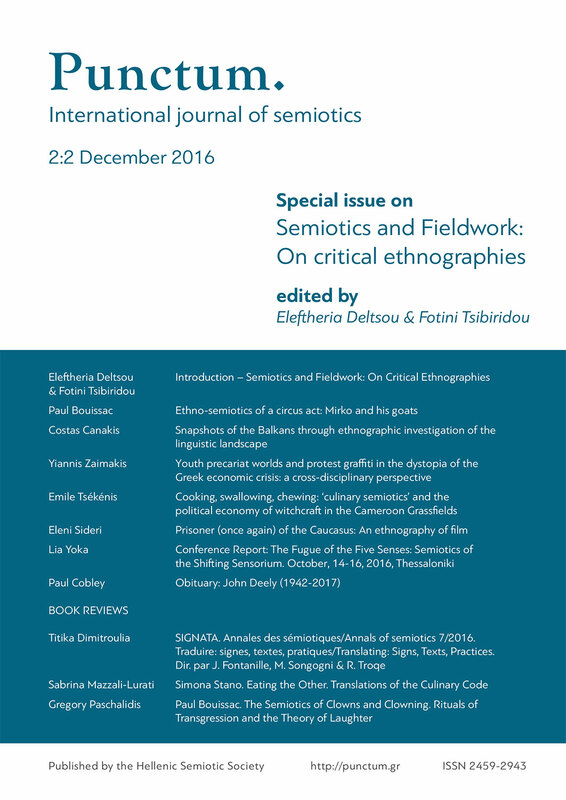 Volume 2, Issue 2 (2016) – Semiotics and Fieldwork: On critical ethnographies | Punctum. University of St. Thomas, U.S.A.
Punctum is a blind peer-reviewed, on-line journal dedicated to the semiotic study of contemporary cultural texts, practices and processes, published under the auspices of the Hellenic Semiotic Society. 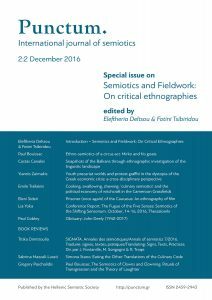 Aspiring to provide a venue for the advancement of international semiotic scholarship, the journal is published twice a year (July & December) in English, although submissions in French and German will be accepted as well. Punctum’s Editorial Board reflects both its international scope and the diversity of contemporary semiotic research and theory. Punctum invites submissions (original papers, review articles, book reviews) across this wide range of semiotic fields and methodologies on an on-going basis, and regularly puts out calls for special issues with guest editors.